Lightwaves Radio, Mangled Radio & T-Radio London U.K Present “THE WENDY ADAMS SHOW”, “MUSIC TO MANGLE YOUR MIND ” & “NIGHTMARES” Returns LIVE TODAY Join us at 12 pm EST For 3 Shows in a Row!! 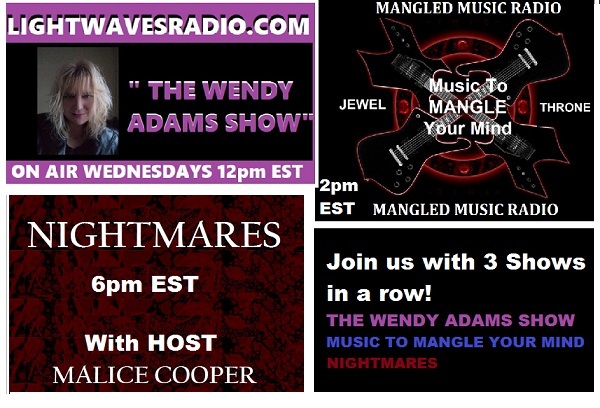 Lightwaves Radio, Mangled Radio & T-Radio London U.K Present “THE WENDY ADAMS SHOW”, “MUSIC TO MANGLE YOUR MIND ” & “NIGHTMARES” Returns LIVE TODAY Join us at 12pm EST For 3 Shows in a Row! !